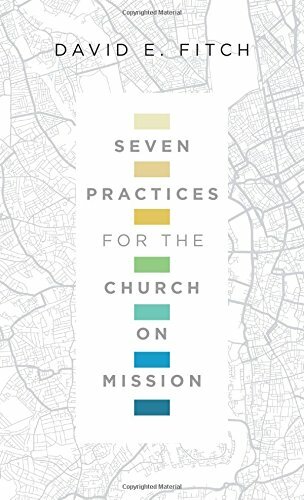 This is Part One of a new series of posts using David Fitch’s little book Seven Practices for the Church on Mission (IVF, 2018) as a launching pad for some thoughts on discipleship and mission. Adapted from his 2016 book Faithful Presence: Seven Disciplines, this pocket version provoked questions and responses I felt worth sharing. In both books, Fitch writes about practices Jesus gave his disciples for opening themselves to his presence. At first I was surprised that worship – particularly sung worship - did not get a chapter; however Fitch has chosen dominical practices, ones that Jesus explicitly told his followers to imitate in continuing his mission in the world. The book starts with the Lord’s Table. The place where we eat together – not as individuals but as a people called into community. Its purpose is the reordering of our lives that is the Kingdom or Rule of God. Almost all Christians practise the Lord's Table or ‘communion’ where bread and wine are shared in a ritual based on Jesus’ last supper with his friends. As far as I know Quakers do not practise communion, and historically the Salvation Army didn’t either, for a raft of reasons. (These days some Sallies in New Zealand offer communion, although it may happen in a side chapel.) Those churches who do celebrate communion do it in a diversity of practical forms – weekly or less regularly, led by a priest or shared by members, using real bread or special wafers, using wine or juice, with a shared chalice or individual glasses, and following an ancient liturgy or none. However there is a common core, and Fitch claims that this always includes an Invitation, words of Institution, prayer of Thanksgiving, Invitation to the Spirit (epiclesis) and Distribution of bread and wine in accordance with the pattern left to us in the New Testament (Mark 14: 22 – 26, 1 Cor 11: 23 – 26). If Fitch thinks that is the global common core, he hasn’t been in a Kiwi Baptist communion service. Many I’ve attended have been almost a-liturgical, with no institution or invitation, perhaps no Scripture at all or perhaps no thanksgiving, often no explanation of what we are doing or why. We could all be in a private glass box with God, free to think our own thoughts and pray our own prayers and this sometimes applies even when we do get the liturgy right in my mother church of Presbyterianism. It seems to me that in evangelical churches our concern not to be Papist has sometimes downgraded the sacrament into a mere remembrance, where for a few minutes we individually meditate on the Cross and what Jesus has done for us. We rarely smile with others or even to ourselves. Which is why this chapter raises some very important ideas about practising the presence of our God around a table and with a missional mindset. Across the denominations a uniquely “real presence” of Christ in Communion or Eucharist has been acknowledged, although the relationship of this presence to the physical flesh and blood of Jesus has been subject to diverse understandings and not a little controversy. This book frequently uses the phrase “tend to Gods presence”. I struggle with this but maybe it's familiar to Americans. I think Fitch means “attend” – notice, be alert to, as he says “our eyes are opened and we recognise his presence in a special way”. Luke 24 reports this happened on Resurrection Day when Jesus shared a meal with a couple of disciples at Emmaus, and that when he blessed and broke bread they recognised the Master who had seemed a stranger on the journey from Jerusalem. For me as a Presbyterian, sacramental moments when grace is imparted by Christ through something physical eg water, wine, oil, laid-on hands, even handkerchiefs, are conditioned by faith. So when Fitch says “His presence always brings the reordering of our lives," I would rather say “attending” or even “leaning in” to his presence does that. Around the table, God’s kingly rule brings forgiveness, healing, reconciliation and renewal, as a new social order aligned with his purpose is formed. But this missional table is not just for Christians on Sunday morning. Fitch introduces here the paradigm he will use throughout the book, the idea of multiple spaces; the close-circle of believers, the half-circle of hospitality, and the dotted-circle of community. The Lord's Table is a practice for all three. In the first, Intimate Circle, relationship with Christ is central. He is the host, in charge, yet vulnerable, with a servant‘s towel. Intimate conversations are happening but his presence also reveals human brokenness. As evangelicals, we seem to have lost the social dimension that binds us together in the presence of Christ and his kingdom rule. Fitch has blogged about relational postures that will help us recover that. The Dotted Circle extends Lord's Table into the neighbourhood; believers gather at a table with space to welcome strangers. Fitch describes a Friday night meal he hosts, but in it I recognise the format of the home-based small-group here in Auckland. 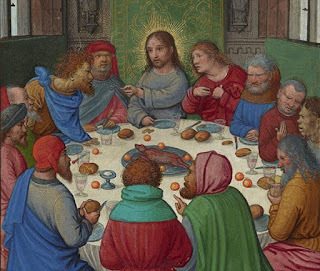 This hospitality does not offer bread and wine, but it is sacramental, as it extends the presence of Christ to “curious onlookers.” Others are present who were not at the first table and space is opened up for glimpsing the kingdom and the King. There are parallels here with Frost’s “five missional habits” about which I have written elsewhere; being sent, eating, listening, learning and blessing are all there. The Half Circle is where the hurting and marginalised live. We can only come as guests, vulnerable, powerless, but still paying attention to where God is at work. Because Christ is present there too. 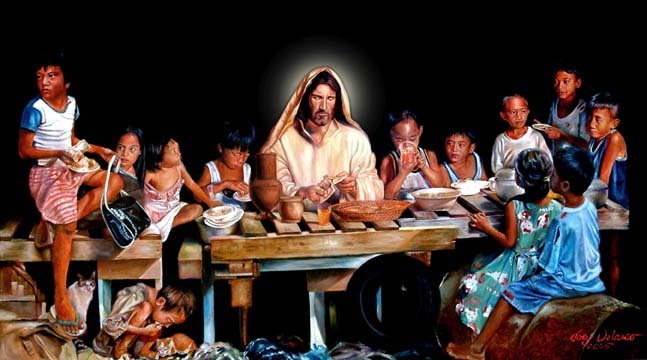 In Luke 10: 1 - 9, Jesus says to the sent-out 72 to sit with people around the table before proclaiming the gospel. To stay long enough to discover the persons of peace. To incarnate the Lords presence in places of brokenness and at the right time there will be space for good news. 3. Becoming guests at the tables of others. normal kingdom life. A colleague who researched churches that were connecting well with young adults found they often met around a table and reported a sense of family. So Fitch reckons we need to recover this practice, and reappropriate the table for mission. Tod Bolsinger writes in his 2015 book on adaptive leadership Canoeing the Mountains that successful adaptive change is always a healthy adaptation of the existing DNA of a church, and that leaders first need to gain clarity on what will never change. Fitch has helped me see that the Lord’s Table is a given, it is in our ecclesiological genes, but that today Christ is calling us to discern and cooperate with what He is doing in and around other tables in our community. To consider: How can you see this paradigm being employed for mission in your own context?